Royal Canadian Navy. BOC: May 29, 1952. SOC: Mar. 26, 1958. Flew as #374 for VC 920. Simsbury Flying Service, Simsbury, CT, 1964-1972, registered as N4039A. 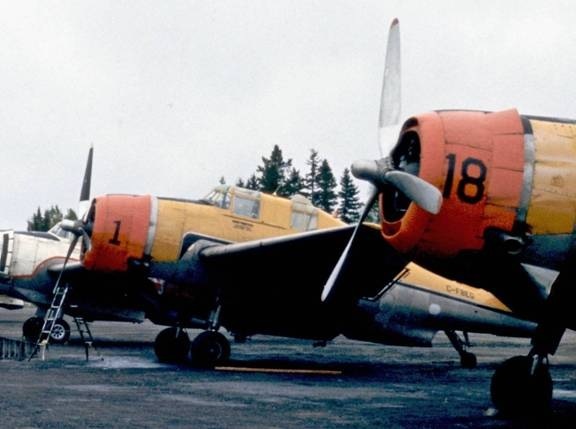 1972 – According to a letter to FPL dated 7 December, 1971, Paul Daigle, general manager of Miramichi Air Service Ltd., asked FPL if it was possible to temporarily import N4039A under Miramichi Air Service Ltd., in order to work the coming season with FPL. 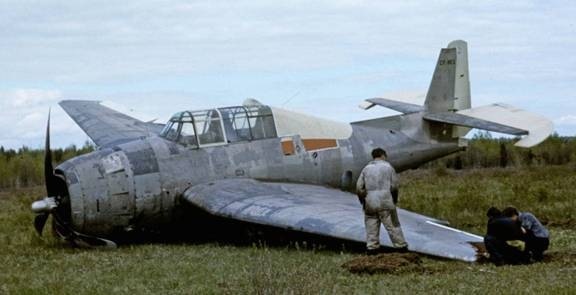 This aircraft and one other (#A25, later FBEF) were still registered in the United States and he did not think that it would pass the inspection date of 15 February set by the CTC (Canadian Transport Commission). Only N68683 worked in NB that year. 1973 – According to a handwritten and annotated list from FPL, FBEG did not fly in NB in 1973. However, the crash images below, dated 27 May 1973 from the accident card, indicate that it was present for the spray season. Perhaps it crashed before the spray season began and was thus not included on the list. 1974 – Pilots Bisson and Gallagher. 1975 – Pilot Bisson. 1976 – Spare. Pilot Bisson. Department of Transport accident card describing the FBEG crash. 1977, 1978, 1979 – Pilot Kelly. 1980 – Pilot Brechin. 1981, 1982, 1983, 1984 – Pilot McKinnon. 1985 – Sold to buyer in USA. 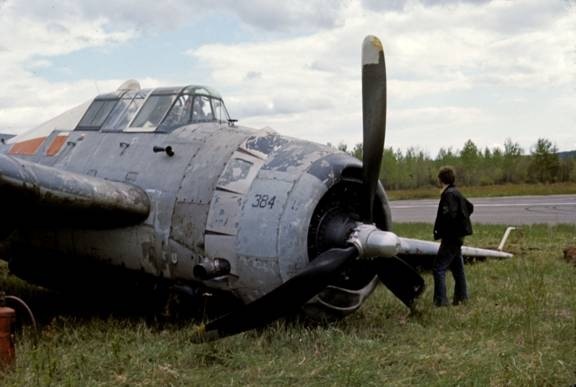 Hicks and Lawrence TBM #1 FBEG at Dunphy, 1979. Hicks and Lawrence TBM #1 FBEG, with sister TBM #18 FXOM in background, Dunphy, 1979. FBEG in the pits at Brockway, June 1981. The “Yogi Bear” logo is visible below the cockpit. FBEG in the pits at Brockway, 1984. New colour scheme. Hicks and Lawrence TBM #1 FBEG and #18 FXOM in pits at Brockway, 1984. 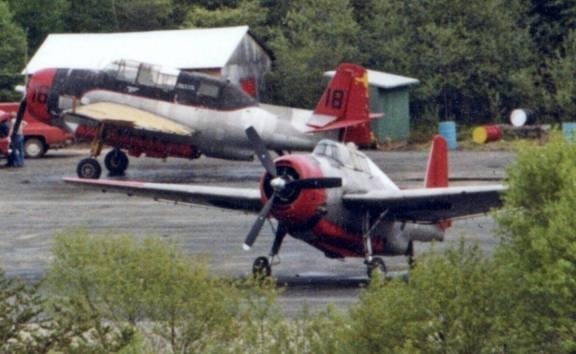 Hicks and Lawrence TBM #1 FBEG parked between sister TBM #18 FXOM and FPL #11 GLEP, Dunphy, 1984. Syracuse Flying Service, Syracuse, KS, Oct. 1985-1986. Registered as N28SF. Chuck Wentworth/CC Air Corp, Rialto, CA, Dec. 1986-1995. Charles G. Wentworth, Paso Robles, CA, 1995-2015. 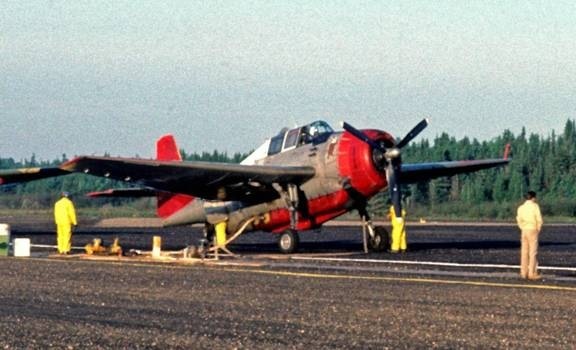 Flown as USN/85983/X2. Aerial Visuals has several recent images of N28SF in military colours.